Strada Vecchia (meaning “Old Road”) is an event with only a tenuous link to accordions (The link will be revealed to those taking part). 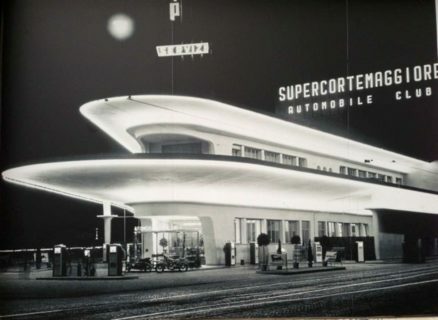 It is in fact a nostalgic road trip from the UK to Italy based on a 50-year-old route via France and Switzerland celebrating the early days of that post-war era when, after wartime austerity was finally over and finding themselves being able to afford a motor car, people first packed their families and suitcases into their only family car and ventured across the channel on an adventurous journey across our continent. Things were not as easy as they are today where such a journey we take almost for granted. Preparation started well before departure. Cars needed to be serviced twice a year in the 60s. Roof racks were often mounted and tyres changed if needed. Green cards would be needed to cover insurance abroad. The AA and RAC could print you out long fold-over maps detailing the best route to your chosen destination. Petrol coupons could be bought to make petrol in some countries more affordable. One needed a different currency for every country one passed through and there were limits on the amount of cash one could take out of the country so one would need travellers cheques as credit cards were relatively rare and even more rarely accepted. 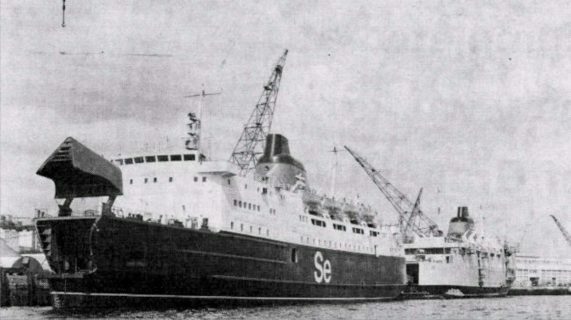 Ferries would be booked as would some hotel accommodation along the route at a suitable stopover point. Some preferred to see how far they got then take pot luck that they would find a hotel with rooms available. 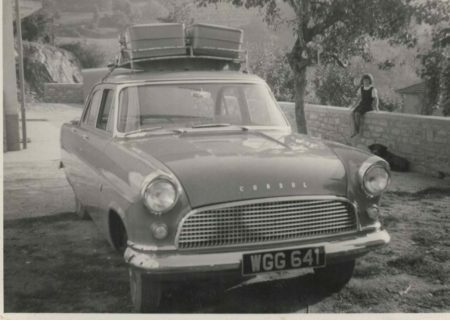 Then with every nook and cranny in the vehicle utilised for cramming in any holiday essentials they would set off. First stop was the ferry from Dover, Folkestone, Southampton or any other way to the continent. 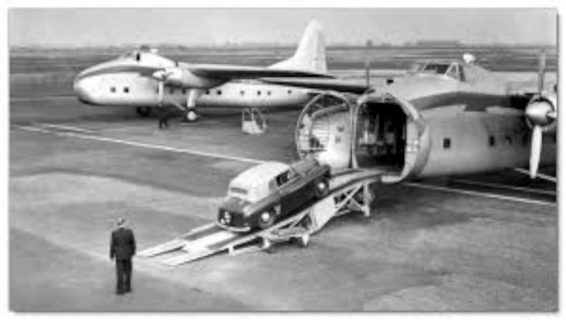 There was even a car-carrying aeroplane service from Lydd Airport in Kent that ferried cars across to Le Touquet. 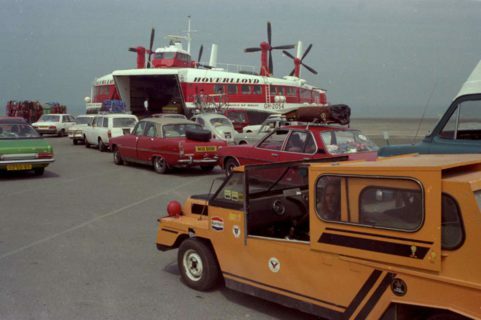 Who can forget the famous Hovercraft from Ramsgate and Dover which got you across the Channel in half an hour! Long queues at customs at every border control with officials looking through luggage to make sure nobody had too many packets of cigarettes or bottles of alcoholic beverages. If one chanced to see another UK number plate or GB sticker on a car one would inevitably toot or wave and even travel tracts of the road together for company only to wave good-bye when the routes diverged and one car would pull off the road. Inevitably one would stop for baguettes in France and maybe play some musette music on the tape cassette player or radio (if one could tune to a local channel) whilst cruising along those dead straight tree-lined hilly roads in France. At four o’clock a suitable “pull-in” would be sought at the side of the road and out would come the camping gas, the kettle, the tea bags, the thermos flask of cold milk and some warm custard creams that someone had partly crushed accidentally in the squeeze to fit more things into the car. There weren’t as many motorways in those days and once off the M2 in Kent one might not use one at all. 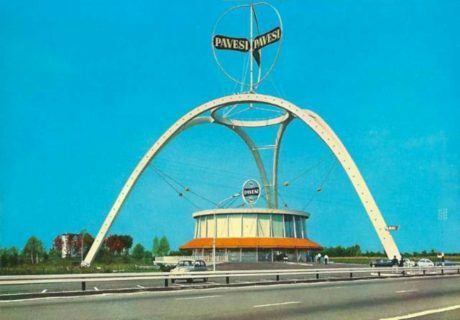 The fledgling motorways seemed very glamorous with their space-age service stations and sunny names like L’Autoroute de Soleil or L’Autostrada del Sole. Later as the motorway network in Europe expanded some chose to take it whilst others remained faithful to the “old road”. 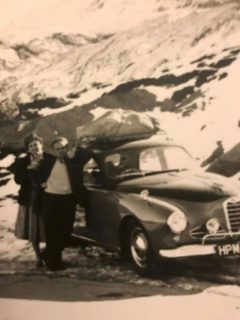 If heading to Spain the Pyrennees would need to be scaled and if one was travelling to Italy the the Alps made a formidable obstacle with snowfall sometimes taking one by surprise at the top of a pass even in the summer months. 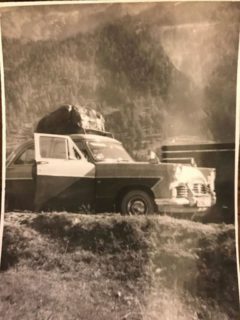 The Simplon Tunnel (once the longest tunnel in the world) offered (and still does today) a regular train ferry service between Brig in Switzerland and Iselle in Italy thus sparing the tired drivers and their vehicles the climb up the pass. One might sleep out for a second night or even a third. 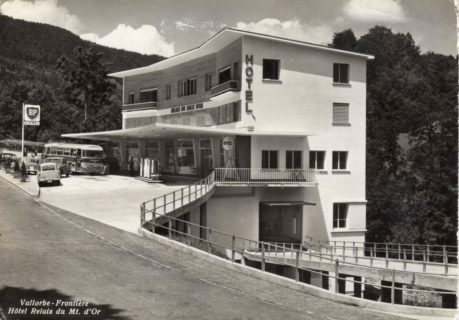 The drive was part of the holiday and walking around a continental town by night and enjoying an ice-cream whilst hearing the trains whistle as they sped through the town station on their way to a more glamorous destination all added to the thrill of being there. Eventually the final destination would be reached and real relaxation would begin, but conversations with other holidaymakers or friends and family living abroad would be peppered with stories of how death was narrowly avoided when a tractor and cart pulled out in front of the car on that country road or how the fully laden car had to be pushed for half a mile to the petrol station because of an empty tank! Loads more of these funny stories are on the www.stradavecchia.com website. In a nutshell, Strada Vecchia aims to recreate this more leisurely approach to travel. It’s not a race but there’s loads of harmless competitive fun. 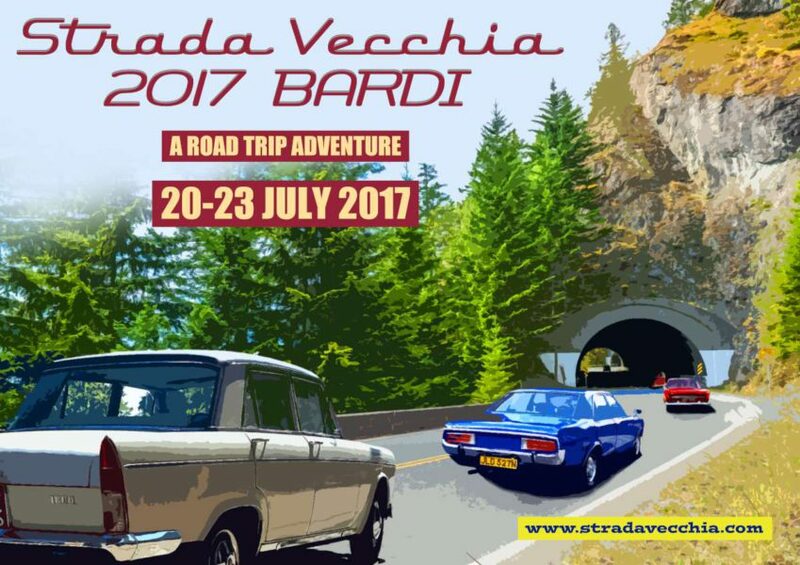 The event starts on the 20th July and your destination is Bardi in the North West Italian Apennine moutains. 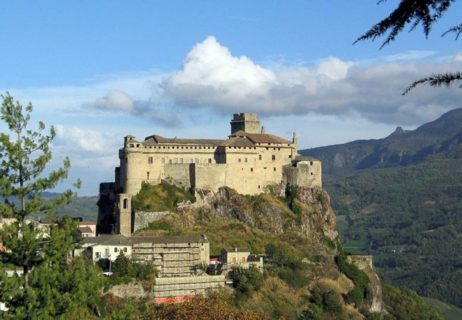 It’s a beautiful mountain village with a dramatic castle perched on a rock jutting out of a mountainside. You have to book your own ferry and two nights of accommodation according to your needs and your vehicle’s abilities. (on day one and day two) along the route but the package does include two dinners en route and 2 nights stay in Bardi and various other things outline on the www.stradavecchia.com website. Each car will have a tracker so progress can be charted on the Strada Vecchia Facebook page https://www.facebook.com/StradaVecchia2017/ Each team will have certain fun challenges to complete en route and will have to adhere to the 1967 route which will be provided as part of the package. There will be a place to exhibit your classic vehicle in the Piazza in Bardi (Non- classic vehicles may participate but will not be part of the classic car display). On the second day at the destination (Sunday 23rd July- Day 4 of the event) there will be a local cavalcade and then a gala dinner with trophy presentation. This event will be limited to 20 vehicles so register early via the website. Teams of two minimum but the more you have in your team the cheaper it gets. For more information please look at the website and register your interest until the registration documents are released on March 1st 2017.